Time Capsules strike me as small townish and a bit old fashioned. Maybe my second grade drawings are buried in one somewhere in the prairie town where I grew up outside of Chicago. 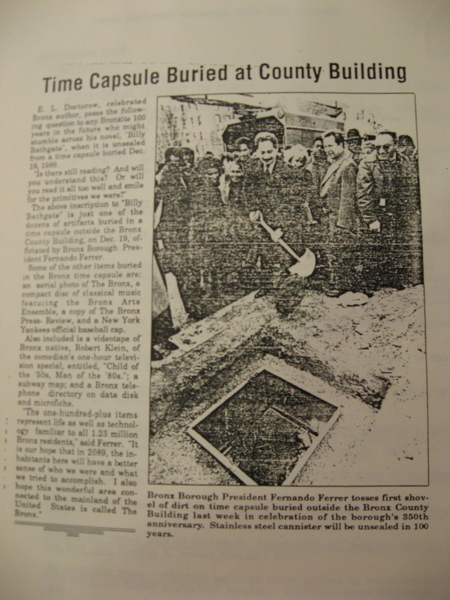 So I was quite surprised to discover a time capsule marker on the grounds of the Bronx County Courthouse. It was buried there during a ceremony on December 19, 1989 to commemorate the 350th anniversary since Jonas Bronck first arrived. And it is scheduled to be unsealed in 2089 after 100 years in the ground. What are among the books, newspapers, posters, photographs, letters, video tapes, audio cassette tapes and lapel buttons buried there? A Bronx telephone and address directory. A list of churches, schools, funeral directors and hospitals in existence for up to 100 years in 1989. A 30cc syringe with articles and texts reflecting the concern for drug abuse, spread of AIDS and the improper disposal of such medical devices with respect to protecting the environment. A quarter, dime, nickel and penny. Letters from President George Bush, Colin Powell, David Dinkins (then Mayor Elect) and Arne Thoren, the Swedish Consulate General congratulating the Bronx on its anniversary . Oral histories and impromptu interviews with the Bronx people, community leaders and elected officials. 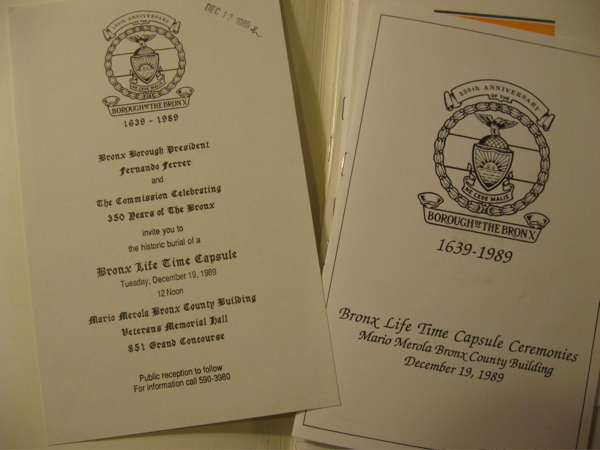 The bill for the Time Capsule and a brochure on how it was made. Borough President Fernando Ferrer’s business card and his cigarette lighter, donated upon his cessation of smoking December 1, 1989. 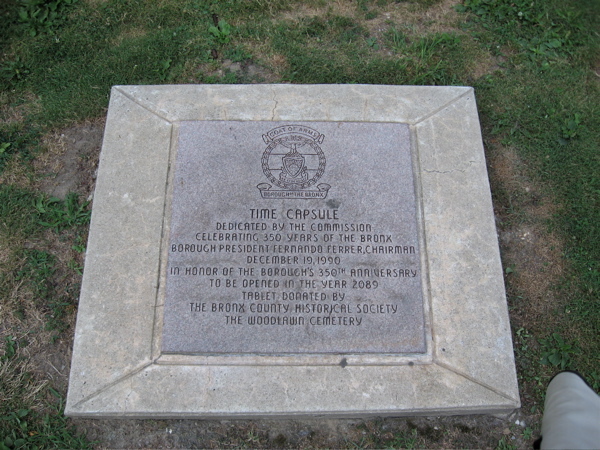 The marker is on the northeast corner of the Bronx County Courthouse Building on the Grand Concourse side near East 161st Street..